One of the most successful tricks I used this year with my elementary piano students was mystery cards. I made 12 cards, each with a different behavior that I want to see all of my students display. At the beginning of the year, I gave out a list so the students would know what I expected. At each subsequent lesson, the student drew a card from the deck, but couldn't look at it. I did look at it, and then watched throughout the lesson for them to demonstrate that behavior (or not!). If they did, they earned an extra music buck. I often forgot, but the students never did. They'd stop me in mid-sentence and say "Mystery Card!" When a student started doodling on the keys while I was trying to explain something, I'd just say, "I hope you don't have that doodling card..."
I made these up on Word and printed them on card stock and let one of my students cut them out. If you want to be all neat about it :-), you could print them on business card blanks. 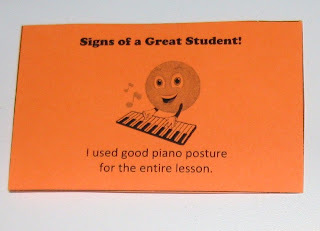 Here are the "signs of a good student" that I used on my cards. Maybe you can think of more! 1. I remembered to bring my notebook and my music. 2. I kept my eyes on my music and not my fingers. 3. 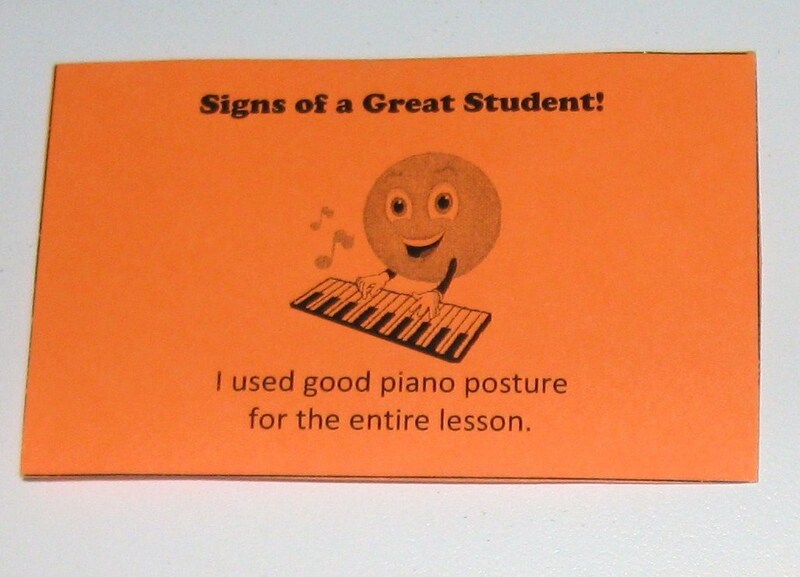 I used good piano posture for the entire lesson. 4. I played all dynamics correctly without being reminded. 5. I played slowly and carefully (when appropriate, of course). 6. I played all note values correctly on assigned pieces. 8. I didn't make any excuses. 9. I had a positive attitude. 10. I used a great hand position for the entire lesson. 11. I adjusted the bench before I played. 12. I listened well without doodling on the piano. I love these - especially the ones about not doodling or making excuses! I know a couple students who could really benefit from this activity. Thanks for sharing. This is an awesome idea! Thank you! This is a fantastic idea! This would work so well with any incentive program (and I'd give just about anything to put a stop to a couple of "serial" doodlers!). Definitely going to give this a try - Thanks!! I've posted this idea under resources on my website. http://www.mvpianostudio.com/resources.htm I used it in December of 2008 to motivate students to keep working and develop good habits. I had seen this idea at an MTNA convention. The exhibitor had taken a Campbell's soup can and put cards in there that the student would pick out to determine the order of the lesson, i.e. sight reading, repertoire, recital piece, scales, etc. I adapted it as "Mystery Reward Cards." I think others have done the same with popsicle sticks that a student draws out of a cup. Thanks for a great idea! 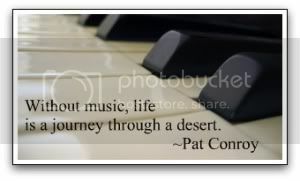 I'll be using it this summer with my piano students. I loooooove this idea! I'm definately going to be implementing this, thank you! Wonderful idea. Thank you so much. Can't wait to start using it after Easter.